Athens is a city rich in history. It appeals to many travelers, including backpackers, school groups, educational programs, cultural clubs, and families. The city has many sites and attractions that can keep you entertained for days, or even weeks. Some hostels prefer to work with smaller groups, while others are prepared to accommodate larger groups. It is best to work directly with your hostel to ensure that they are prepared to meet your needs. Athens Backpackers is a great centrally located hostel that is between the Temple of Olympian Zeus and the Acropolis. The atmosphere is lively and social and the staff encourages guests to interact and get to know each other. There's a roof top bar that is the center of activity for the hostel. The rooms are clean and comfortable and the central location ensures that your stay in Athens will be excellent. The hostel is Australian-owned and the staff is friendly and welcoming. There are regular activities for guests including quiz nights, karaoke nights, special events, soup nights, happy hours, and organized walking tours. There are a range of rooms to choose from. The dorms are large and bright and there are private apartments available as well. Each room has a private bathroom. 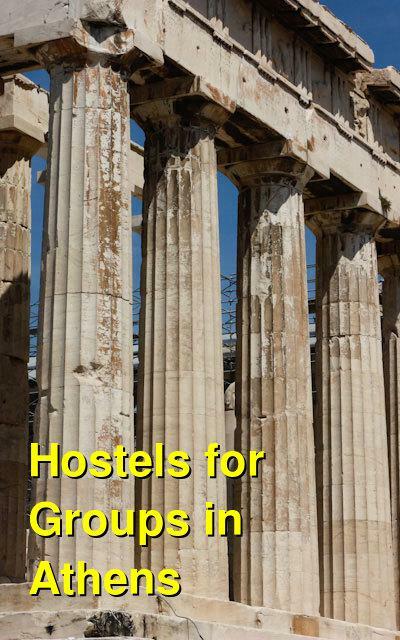 The hostel often works with large groups to plan their stay in Athens. Groups of larger than 10 should contact the hostel directly for a quote. 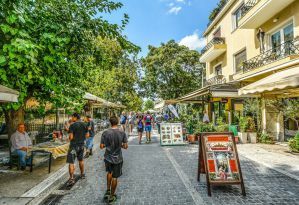 Athens Backpackers Hostel has a relationship with Athens Adventures, and they regularly provide assistance to groups organizing transportation, coordinating meals, or helping plan events. Dioskouros is conveniently located in Athens near many of the city's top museums and restaurants. It's near the Temple of Olympian Zeus and the Acropolis. The hotel is easily accessible from the airport and it has easy access to public transportation. Prices are low and the amenities will help ensure that your visit to Athens goes smoothly. Free breakfast is available to guests and includes homemade french toast, fresh bread, jams and spreads, coffee, tea, and milk. For an additional fee you can upgrade your breakfast to include eggs, bacon, yogurt, and more. There's also a restaurant on site where you can order Greek salads, hamburgers, fries, and other dishes. The hotel is in a quiet and peaceful setting. There are simple private rooms with shared bathrooms. The area is filled with history and guests feel connected to the rich history in the community. The hotel is prepared to accommodate groups of up to 50. They regularly work with student groups and educational programs. There is space in the garden area for organized activities and lunch is available during the day. Fivos Hostel is conveniently located about fifty meters from the Monastiraki Train Station, which offers direct access to the port and airport. It's near the Acropolis Rock and is surrounded by many interesting restaurants and attractions in the heart of Athens Old City. The hostel has clean rooms that are affordable and comfortable. Both air conditioning and central heating are provided. Other amenities include a free breakfast, wi-fi in every room, and a roof terrace with views of the Acropolis. Laundry facilities and an internet cafe are also available. The staff can help organize all-inclusive tours of the Greek Islands and mainland Greece, or they can answer any questions you might have about local attractions. The hostel is prepared to accommodate small groups. Contact them directly if you have any questions or to receive a quote. City Circus is centrally located in Athens just a five minute walk from the Monisteraki and twenty minutes from the Acropolis. The hostel is surrounded by plenty of restaurants and activities and the staff is very knowledgeable about the events that are happening around town. The facility is recently renovated and provides comfort for guests in a welcoming setting. The wooden floors have been restored and the walls and ceilings have been painted to highlight the neoclassical buildings. The hostel is decorated with antiques, retro furniture, and art that is created by local artists. There are 19 rooms available for reasonable prices. Both doubles and twin rooms are available with private bathrooms. There are also larger dorms that sleep between four and six people. Rooms are air conditioned and there are common areas where guests can relax. A free breakfast is also available every morning to guests. Other amenities include a restaurant that serves traditional Greek cuisine, a welcoming staff, and a terrace with views of the city. The hostel is prepared to accommodate small groups, but if your group has more than seven people, contact the hostel directly to make arrangements. Group discounts may be available.